these products, are my little gems that i have used for quite a few years now! i do try other products but i do tend to stick to these especially la roche posay as i find nothing else is as good! 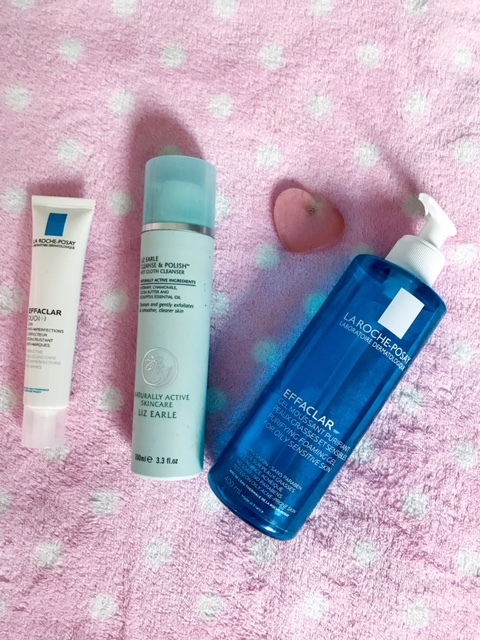 now i say my skin is pretty normal but last year it did go through a weird stage and that's when i knew that these were my definite saviours to sort my skin out! i think i was trying out a new face wash, i cant remember which one exactly it was but that was when i started to get a few problems with my skin- that's all i can think of that it was. i started getting a few spots under my jaw line, which ended up clusters on both sides which became very sore! luckily i could hide them as much as i could with make up- and just let me skin breathe when i could (at home ect). normally places like that where you end up getting spots is normally due to hormonal! but whatever it was- it decided to stay for a fair few weeks! i did get quite down and self conscious about it as i had never had anything like that before. So that was it, time to head to boots to get my trusty products! make up remover- my liz earl hot cloth cleanser, I've used this little beauty for years! removes all of your make up, leaves your skin feeling so clean and soft and no residue left on your skin. la roche posay effaclar duo- can i just say this product is amazing! i have used this for years now and i can honestly say its the best thing ever! its an anti imperfections serum/moisturiser. if you have any blemishes or marks it helps them fade! if i get a spot the blemish tends to stay for a while but since using this, it really is an anti imperfections product, it basically corrects the anti imperfections and any marks on your face and is anti clogging when is perfect for me! a product that has changed my skin for the better! along with the effaclar face wash! its soap and paraben free, since using this its really kept my oily T-zone at bay! this product is tested on oily acne prone skin- even though i don't have acne skin i can assure you this product is soo worth trying out! and this along with my effaclar duo have certainly kept my skin looking and feeling so much better and spot/blemish free!! i cant speak for everyones skin- these are what i find are the best for my skin!but i would reccomend you trying them out if you have slightly oily skin and blemish prone skin :) let me know if you do and what you think!